Rutland’s and Orange Avenue in the 1940’s. The caption of the postcard reads “Orange Avenue looking North”. However, north is the other direction and this postcard view is looking south. The Angebilt and San Juan Hotels provide the backdrop to a time when Orange Ave was lined with department stores like Sears and Rutland’s. In the heart of downtown, Orange Avenue and Washington Street are among the oldest streets in the city. A 129 year old map shows at least a two-story building in the southwest corner of the intersection. (Near the red arrow in the thumbnail) This building may be the county jail as some books reference a jail being built on the corner in 1884*. Braxton Beacham bought the jail in 1917 and later built the Beacham Theater and a few stores on the property. By the 1930’s the horse traveled dirt roads were brick covered and lined with businesses. The St. Charles Hotel was built in the vicinity. On the southeast corner, where Rutland’s would go, was a gas station and an Economy Cab taxi stand. 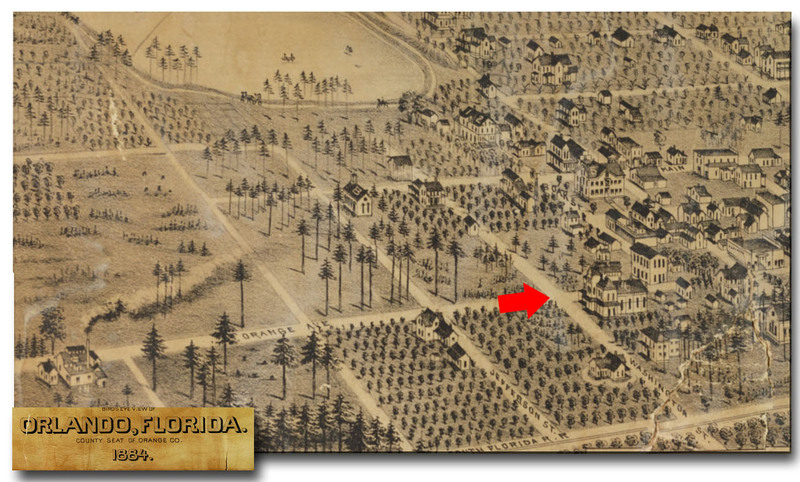 In 1940, Joseph Rutland, a Winter Park businessman, bought this lot for $78,000 to build and open his menswear store. Rutland’s had a wide selection of menswear brands and custom tailored suits. In its 30 years of doing business at this location, Rutland’s built a large customer base by selling the better brands of men’s clothes and providing well-known customer service. Future U.S. senator Mel Martinez at one time was among the service staff having sold shoes at this location. The building is Art Moderne style and was built by F. Earl Deloe. Deloe was a local architect who started his career in Orlando at 19 working as draftsman for an architect. He served in World War I also as a draftsman, and later worked for the Army in World War II as an architect. In fact, before he went to work for the Army, some of the construction for the Rutland’s building took place during World War II. Other buildings to his credit are the College Park Baptist Church (1945), Church of Our Lady of Lourdes (1931) in Melbourne, and an art moderne remodel in 1949 of the Sun-Ray Cinema in Jacksonville. He continued with a long career as an architect in Orlando until his retirement in 1965 and lived out his years in College Park. The Rutland’s building is perhaps his most recognizable work and one of the few remaining buildings representing this era. Originally two stories, three more floors were added to the building in the 1950’s for added retail and office space. In the years to come, shopping shifted from downtown and moved to the malls. In the 60’s, Rutland’s moved its business from this location to a few malls in the area. The last Rutland’s location remained in business until 1998. When its last store closed at the Fashion Square Mall, the Orlando Business Journal wrote that Rutland’s $500 to $2000 suits (in 1998 prices) could not compete with the lower prices of places like Mens Wearhouse. Rutland’s was another local company unable to compete with the low cost products of national chain. 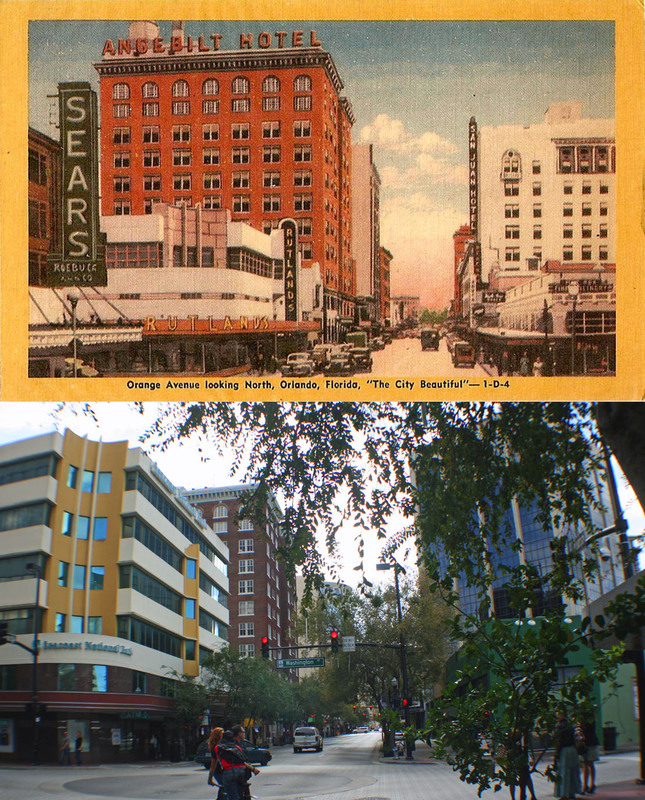 Most of the buildings still stand in the southeast and southwest corners of Orange Avenue and Washington Streets that are in the postcard. The Rutland’s building now houses Seacoast National Bank on the lower level. Across Orange Avenue, the buildings built by Baxter Beacham in the 1920’s are today an assortment of bars, such as Independent Bar, and entertainment venues, like The Social. The Sears seen in the foreground is long gone and the 20 floor Regions Bank Tower was constructed on the site in 1986.